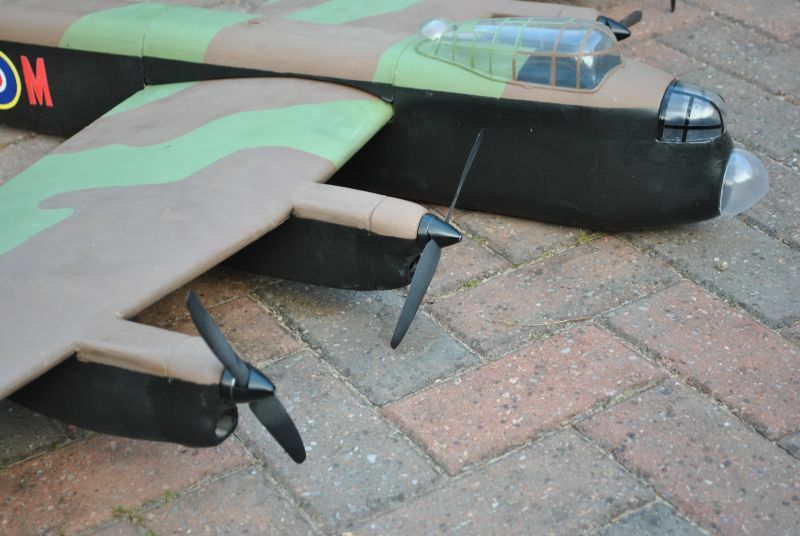 Here is the build of a Radio Controlled Avro Lancaster Bomber from Priory Models which I’ve rebuilt twice and modified a few times. Whenever I fly her the sight of those 4 engines and twin tail in a banked turn is just majestic. The Lancaster was a World War two bomber used by the RAF. It didn’t start well though. Originally it was a twin-engine bomber called the Manchester with Rolls Royce Vulture engines. These were very troublesome and gave the Manchester a bad name. Roy Chadwick knew he had the basis of a good aircraft so he modified it to take 4 Rolls Royce Merlins and had a winner, probably one of the best bombers in World War Two. It was loved by all that flew her. The first video was from 2006 and my camera was not up to today standards and was shot, my son. I just keep in for nostalgic reasons. This is the latest from 2018 and still flying after 10+ years with some onboard video footage. I’ve always wanted to visit the Mohne Dam, one of the Dams breached by 617 Squadron. We had great weather on the 30th of June 2018 and a boat trip on the lake. Such a beautiful place. 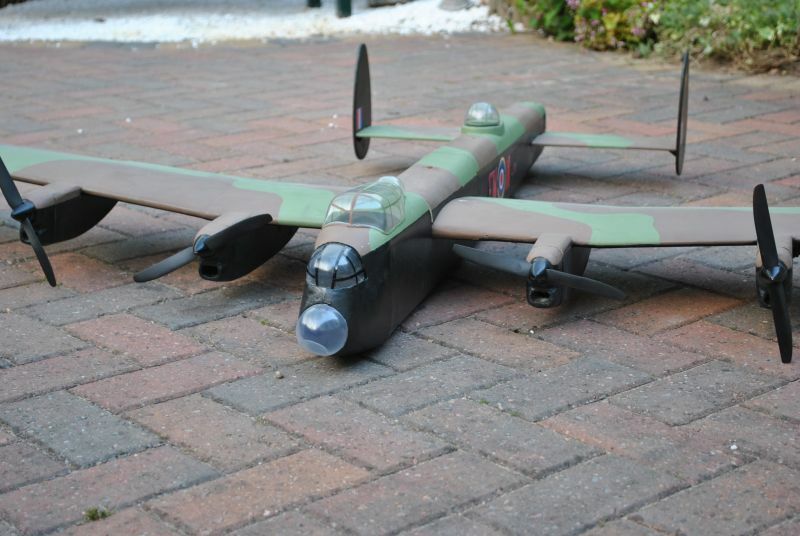 RC Avro Lancaster returns to the skies. 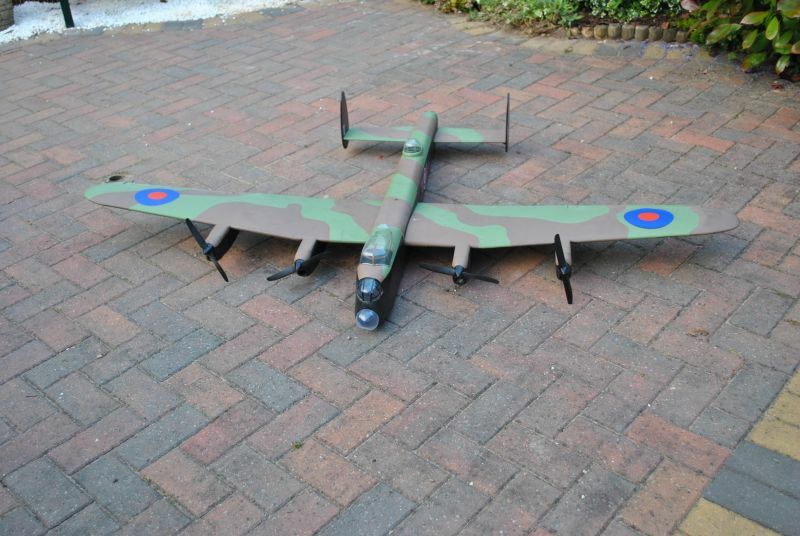 The Priory Models Radio Controlled Lancaster is intended for 4×400 electric brushed motors and has 72″ wingspan. My first two were brushed versions but my latest is powered by brushless motors and Lipo batteries Here’s the phone number 01642 483505, they’re not on the web. Unfortunately, they are not in business anymore. 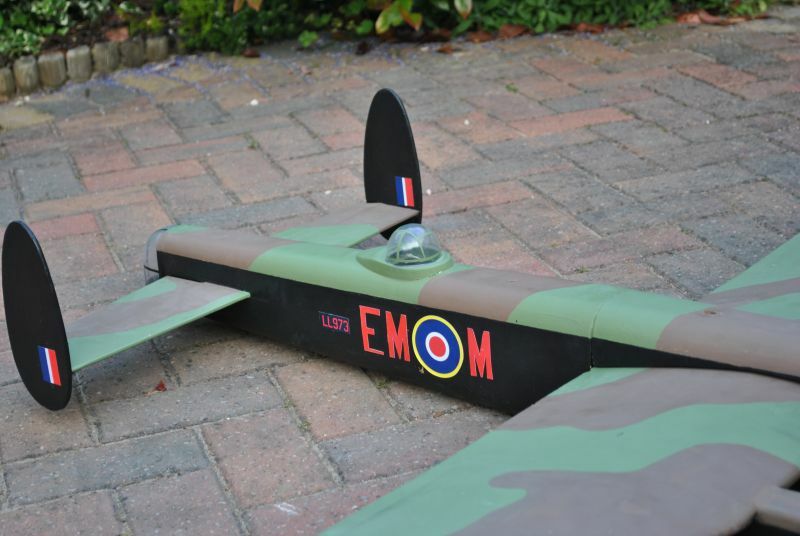 The renowned Tony Nijhuis kit http://www.tonynijhuisdesigns.co.uk/Lancaster72.htm this is a real balsa bashers kit and needs some previous building experience. The Priory kit was about £80 and on the whole is not bad. However, the fit of some parts could have been better. For quality, I’d give it 7 out of 10. Covered in brown parcel paper and PVA glue and then painted with acrylic Tamiya and B&Q emulsion paints. 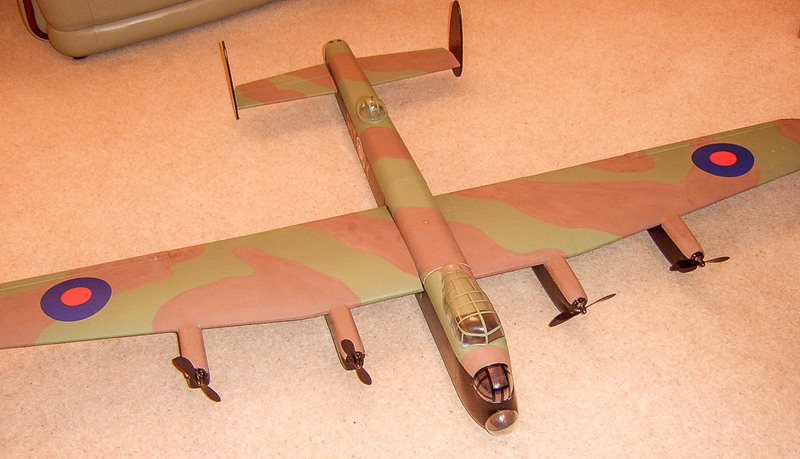 My first Lancaster motors were 400 brushed 6.0 Volt and batteries were 10 cell Ni–MH pack of around 2000mAH capacity. Flight time was around 5-7 minutes, doesn’t sound long but it’s not the sort of aeroplane you chuck around. It’s very easy to fly and launch. A faulty receiver was the culprit, partly my own fault but that’s a long story. 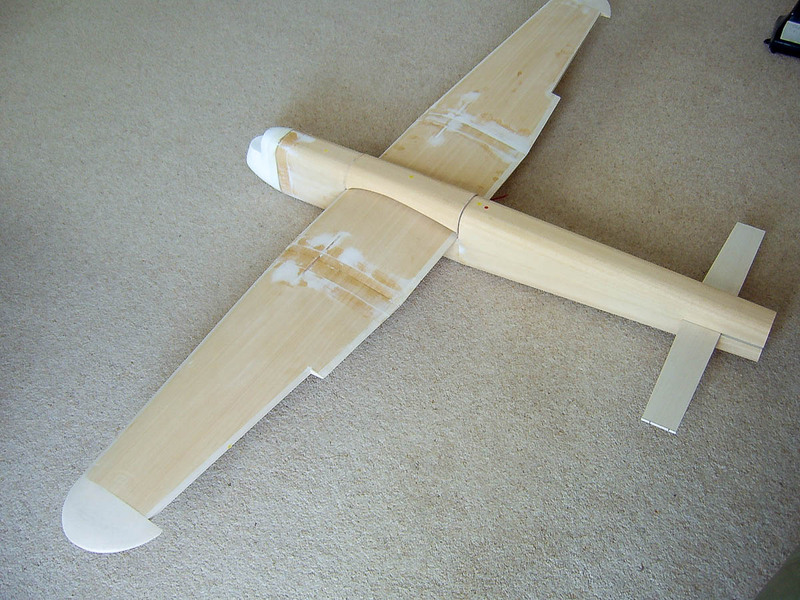 I then converted it fly it on 2.4GHz Spektrum. On the 20th Sept 2009, the Lancaster crashed very heavily. I was gutted it was caused by an overheating speed controller. Prior to this I’d always used a separate receiver battery and had no issues. I decided to dispense with this as I was very confident on 2.4Ghz. The speed controller heat shrink has partially melted so I fairly certain this was the cause of loss of signal. 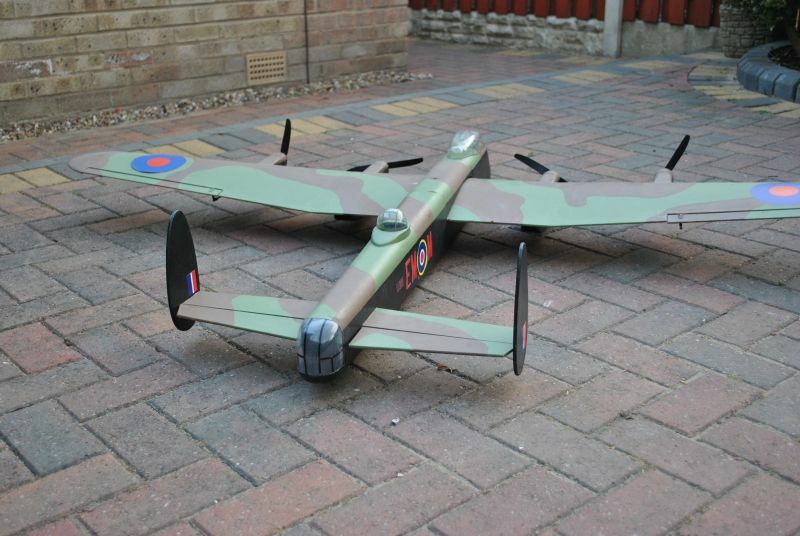 The crash was very heavy and very little survived, but I had a second less damaged Lancaster wing, so I rebuilt her. This time I installed brushless motors and ran a separate receiver battery. 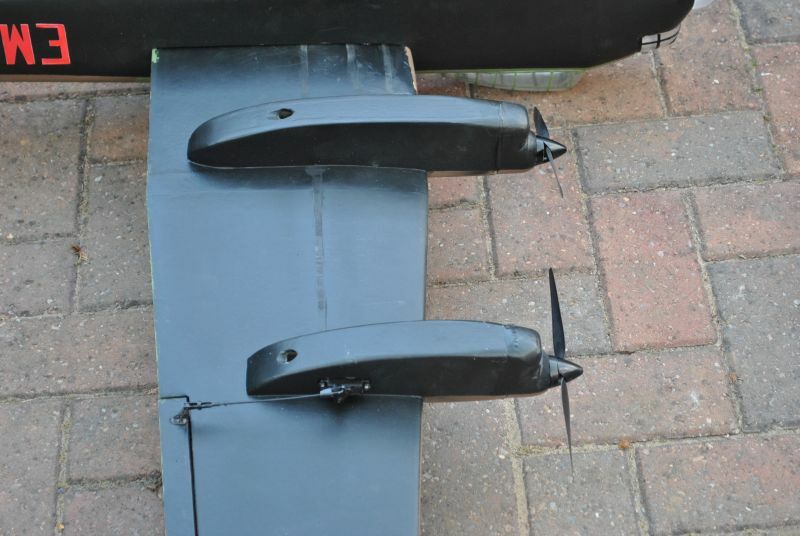 Here’s the start of the wing repair and conversion to Brushless motors. 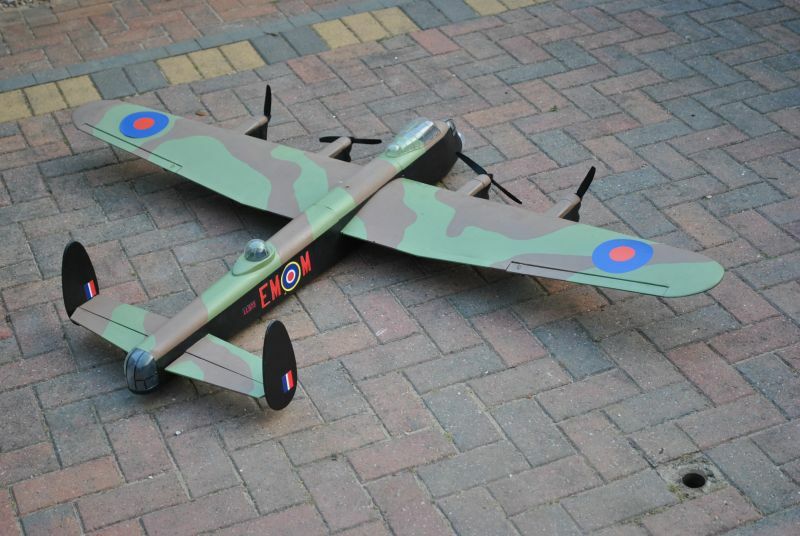 I’ve managed to get a 400 replacement combo deal from BRC hobbies which included speed controller motor and an 8×4 prop. The motor is a Towerpro 2408-21T rated at 1450Kv and the speed controller is 15Amps. I use 4000mAH 3SLipo. On the 8×4 props, BRC says it will give 145 Watts on 3S Lipo so I should have ample power with 4 of them. 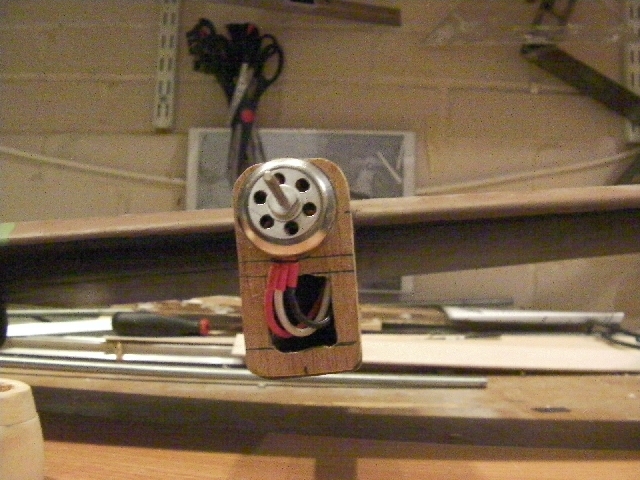 On brushed motors, I think it was pulling about 250 Watts for all four which worked out about 60-70 watts per pound. Maiden flight was a complete success. Batteries are 2x4000mAH 3S. I did intend to use smaller but I needed to add weight for balance so I used the 4000mAH batteries and the balance was spot on with them. 7-minute flight only used 20% of the batteries, had a second flight on the same batteries. 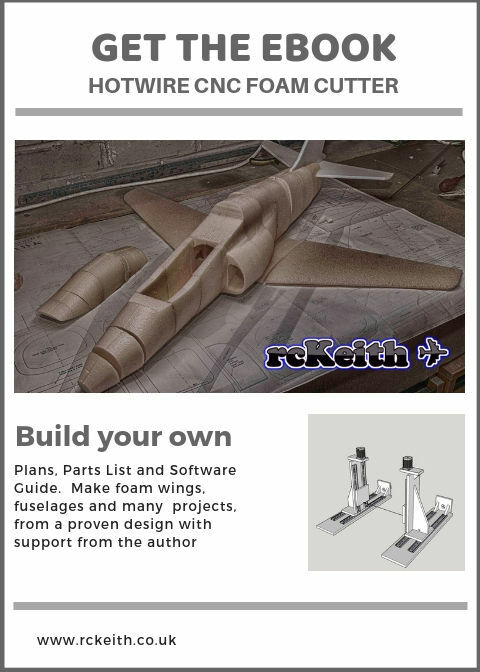 I enjoyed reading your Lancaster build page. Thanks for the informative page. 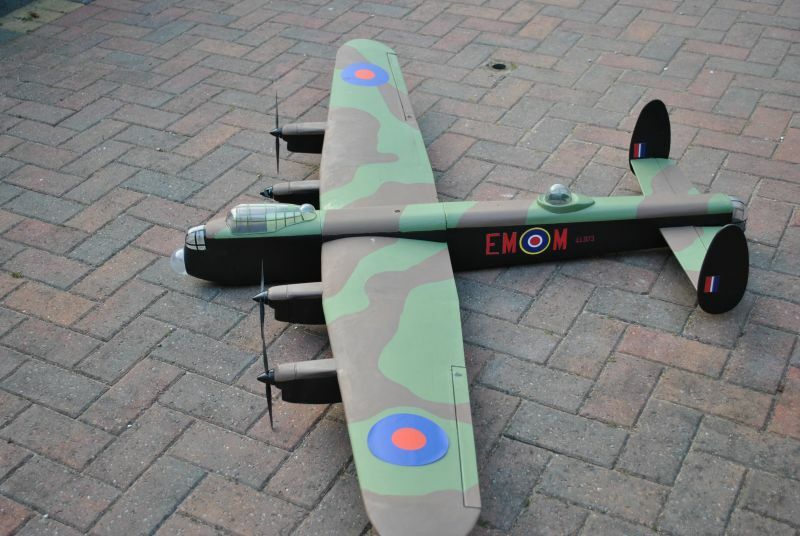 I have a Priory Models Lanc kit that I bought from Elvington LMA show in 2012 (they said it was the last show they were going to do?) and have just got round to getting it out and start thinking about building it. 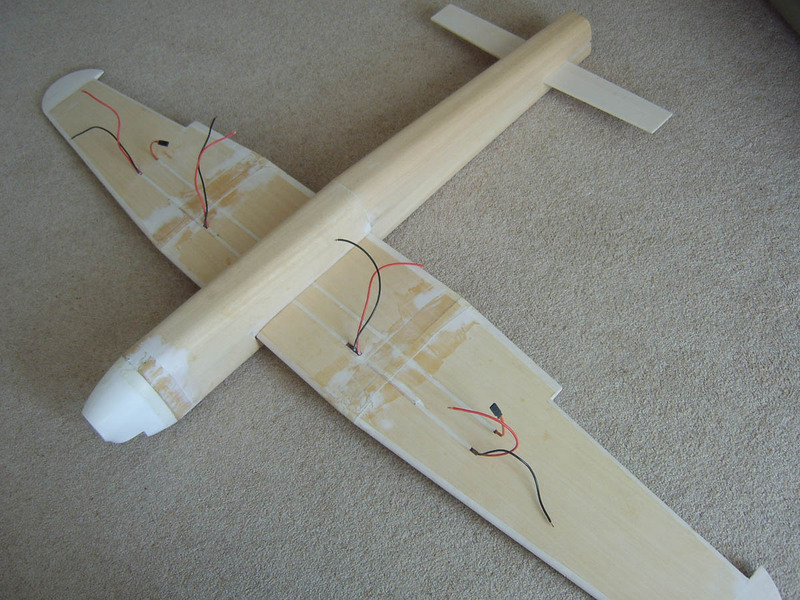 I am planning to go brushless with 1000kv or 1 possibly 1200kv motors and 8×4 props. Ive read online that you should minimise the battery wire length as much as possible while motor wire length from ESC isn’t as important. 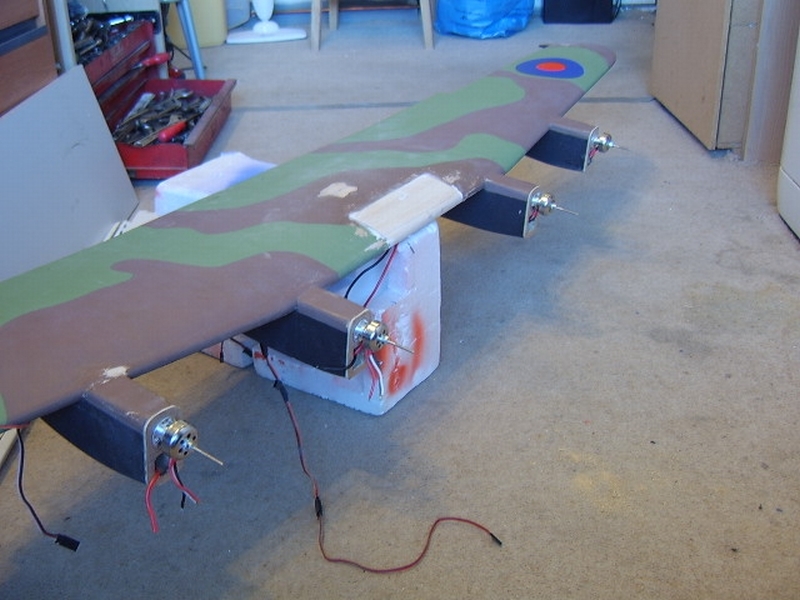 with this in mind where did you place the brushless esc’s in the lanc? Thanks a lot. Thanks for stopping by and reading the article. 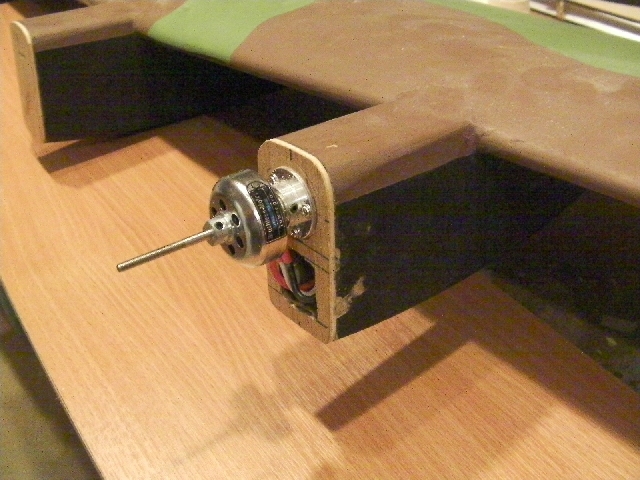 I used 1450kv on 8×4 props and I placed each ESC in the nacelle of the so it was close to the motor. I already had the power leads there from the brushed motors so it was an easier way to do it. 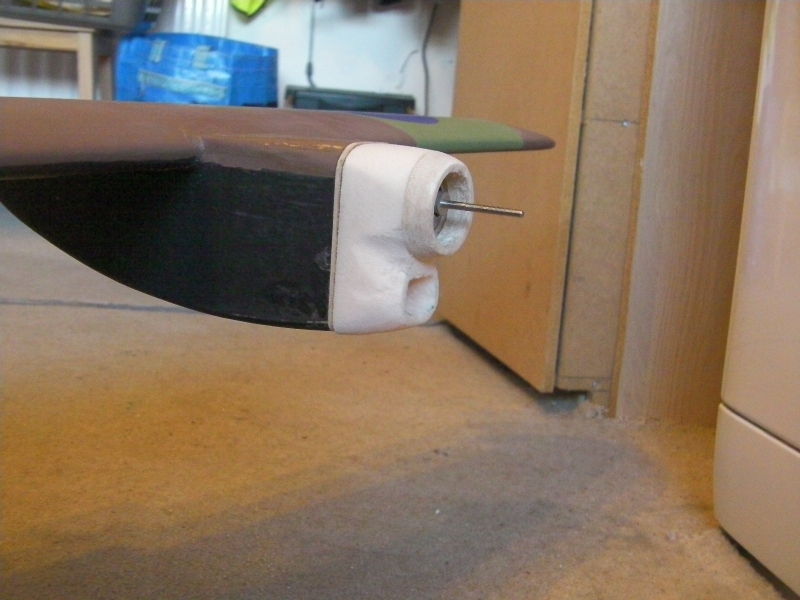 I did make a hole in the rear of each nacelle to allow cooling air to get through. Did you check out the video of it on brushless conversion. So much power now. 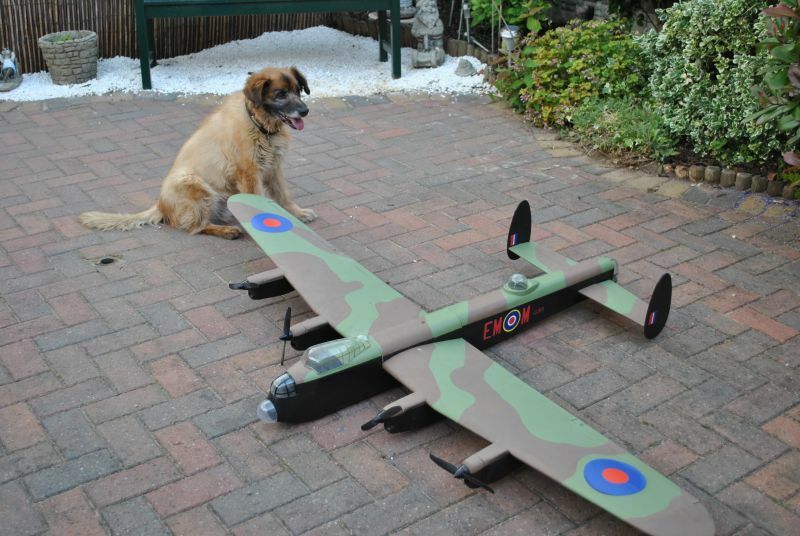 Although it did fly well on brushed. Wow, thanks for the fast reply Keith! Yes it looks nice on the brushless setup with plenty of power. OK thanks for the info. decisions…decisions. Do you still fly the Lanc? Really enjoyed this article. I’ve just been given a very tatty example of this. I am in the middle of converting to brushless, but as there are no instructions, I was hoping you could advise where the c of g should be? Also, can replacement glass still be bought as I’m missing some, and what I do have is very yellow. I’m planning on adding retracts too as I hate hand launching. Thanks for the fast reply Keith. I have had some success in my renovation so far. I found some toys in Tesco that I could throw away and use the packaging. I only need the done for the nose now. I will try the wooden former method if I strike out though thank you. I will also try that number and see what I can get. I managed to fit the retracts yesterday. I will have to slightly widen the two inner necelles to make it look a bit better but it’s all mechanically sound. I have a 30amp esc in each necelle too, powering a 1000kv motor. I plan to fly it off a 3s 3500. I will be using differential thrust to act as a rudder and I’m contemplating a bomb bay, but that will only be if I manage to successfully fly it first. 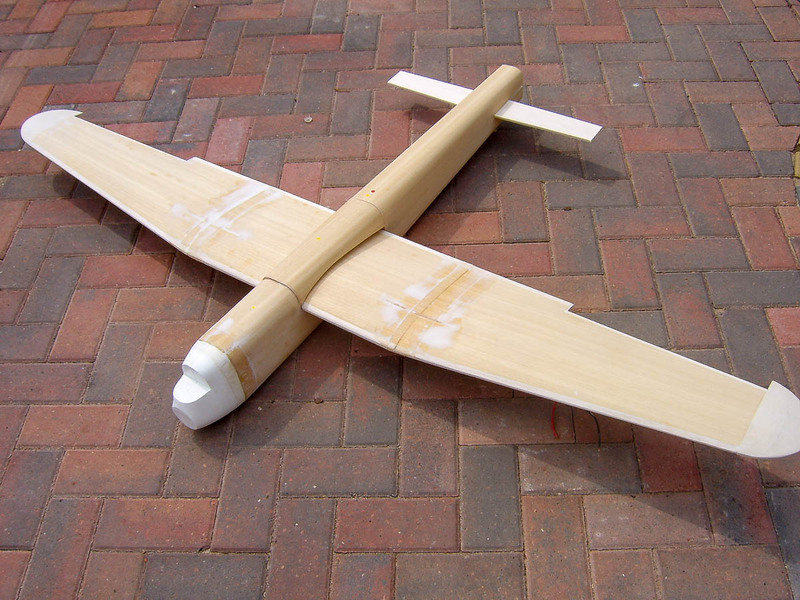 I fly at the Rotherham Model Flying club, live a couple of miles away so its nice and handy. Made me club Sec this year, for my sins. I found with mine it needed nose weight so I use two 4000’s 3s. If I need to add weight then it may as well be a battery. I can get 2-3 flights on them. I’m sure it will look great, when you see that twin tail and 4 merlins in a banked turn its just majestic. You can send any pics to [email protected]. That’s a lot of battery you manage to fit in there. I’m interested to see what will balance mine out. I managed to get hold of Priory today. They are no longer in existence but they did manage to find me the glass. I’m sorting that out now. Motors and escs arrived today. Got it all installed and seems to work well. Hardest bit was programming the transmitter for differential thrust and throttle cut. It’s taken quite a few mixes. One question for you. What sizes spinners do you use? I’m thinking maybe a 38mm, but worried these will be too big? 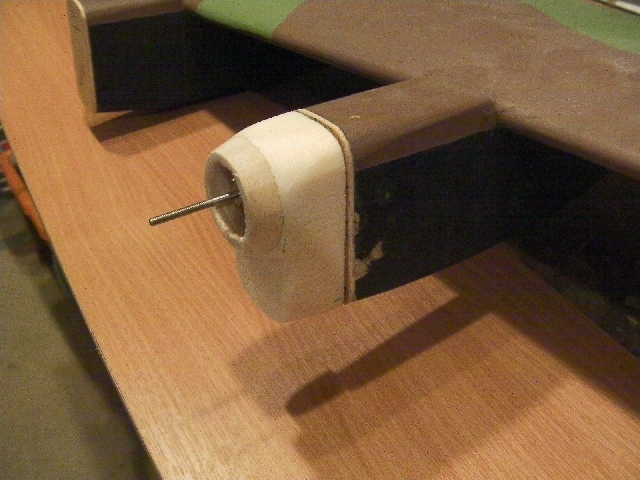 I use 30mm spinners, which I had to ease the slots for the props. I did have a job finding them probalbly could do with being a little bigger. Good luck on the maiden.